Whitburn welcomed Lochee to a sunny and hot Central Park today, matched them in every aspect of the game yet lost to a goal 14 minutes from time when a draw seemed the most probable result. As always there was controversy, however, as a Grant Hamilton headed goal from a corner had been ruled out in the 12th minute for a push in the box that few noticed. Both teams played hard fair football in an entertaining game and each created an equal number of decent chances with both keepers making 3 decent saves. The difference maker came when there was a little hesitation in the home defence that allowed the ball to fall to a Lochee player out wide and his cross was controlled at the back post by the 10 who then slammed the ball past Andrew Wilson. In the end a disappointment but a huge improvement on the game at Lochee at the start of the season proving how far the young team has come. 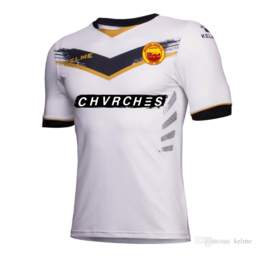 Whitburn Chvrches sponsored away shirts are now available for sale! These highly sought after shirts are now available for sale by clicking on the strip or here. They cost £55 plus postage and packing. If you are local they can be bought directly from Ann Haddow - please contact her if interested on 07917 753017. Any local community group who wishes to use Central park and its facilities should contact club secretary Ann Haddow in the first instance on 07917 753017. There was no winner of the �300 prize. The bus for the Rosyth game leaves at 1:30 next week. Here is a picture of the squad for this season. Whitburn main sponsors who are Karma Indian Cuisine, West Main Street - thanks are due to Dep, Robert and Jaggy, please support our local excellent curry house! Email the webmaster on any topic related to the site. �2000-18 A.Burton and Whitburn Junior FC.